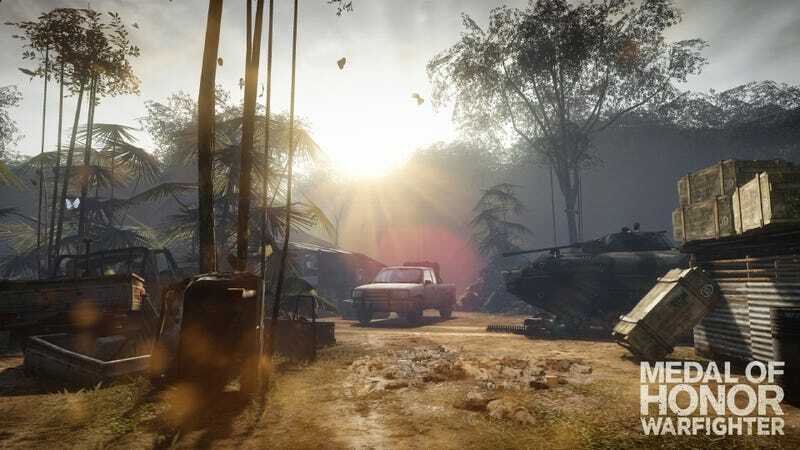 Medal of Honor's community operation is out there trying to gin up a ton of activity on its Facebook page, promising the release of the Medal of Honor: Warfighter multiplayer trailer once they reach 100 percent of ... something. We're told we'll get there if we vote, like and comment on every poll and cover photo for the game's official Facebook page, though since the goal isn't exactly articulated, my guess is that this thing has already been scheduled to release sometime this week. They'll drop another screenshot when they reach 90 percent of this mystery total, but my guess is this one was deliberately chosen because it provides some clue of a feature to be showcased. The vehicles? The tank? The big supply drop? Is this a hint about a map itself? Dunno. The image given to us by EA was called "Location_Unknown." While our ability to accelerate the delivery of said multiplayer video remains dubious, you can keep checking the Facebook page for updates as to when it might happen.